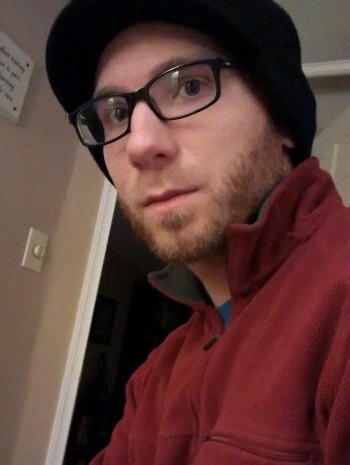 I'm 28, married, father to two precocious felines, and live in New York. I am a newly self-published author. I have a degree in Child and Family Studies with a Minor in Criminal Justice, but all I want to do in life is to write! And I am totally OK with that. I work to pay the bills, but write to live. MJS: My most recent release is titled "The Mighty" and is the first in a series of yet to be determined length. In it, the main character Wyatt is sent to a facility for troubled youth, but finds that his amulet can quite literally take him to a different world. There he vows to save the realm from the oppressive Regents and protect the Draygan warrior, Rozen. But he has no control over his magic and continually bounces between worlds at random. He also meets a fellow resident and vows to help her escape. It's a story of balancing two worlds all while trying to avoid painful memories that whisper from the shadows. 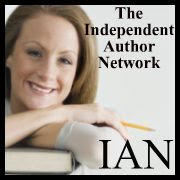 IAN: Is The Mighty published in print, e-book or both? IAN: Where can we go to buy a copy of The Mighty? IAN: What inspired you to write The Mighty? MJS: Right after college I worked for two years in a residential treatment center for "behaviorally disturbed" youth. All of the kids/teens had a different way of dealing with the inhuman trauma they had each suffered. One in particular impacted me as I saw a lot of myself in how he handled things. He retreated into his imagination and spent an inordinate amount of time role-playing as a wizard, warrior, and the like. I often wondered, "what's it like in his head?" "The Mighty" is the answer to that question. MJS: Before I sit down and actually write, I take a few weeks and just think the whole thing over. So while I don't outline in the traditional sense, nothing gets written down, I've done a large portion of the writing in my head. Then I open up a word processor and just write, stream of consciousness style. IAN: How long did it take to write the book? MJS: From conception to final project, about three or four months. I can typically get a full first draft done in about 6-8 weeks, then its all about polishing. IAN: What do you hope your readers come away with after reading The Mighty? MJS: Well, I hope they come away having gone on a fun and fantastical adventure. More than that, however, I hope they are able to catch a glimpse at what a kid like "Wyatt" or "Athena" have to live with on a daily basis. And I hope my readers get a sense of how adult problems and decisions can impact the children around them. MJS: Well, the fantasy portion, where the character is in Hagion, is complete fantasy. But the parts where he is in the youth facility is entirely accurate to the unit I worked on. The layout, rules, atmosphere. Everything. And the residents there truly have gone through some horrific things that they try awfully hard to forget. MJS: Brian Jacques, no question. The man could tell a story and create characters like no one else. I was obsessed with the Redwall series all throughout middle and high school. I dream of being half the storyteller he was. Because it's not about writing, it's about telling a good story. And Brian Jacques is a master storyteller. MJS: Podcasts. I have a job where I can listen to podcasts the whole shift. And while I have a wide ranging taste in audio, several writing focused podcasts gave me the kick in the pants I needed to put my work out there and become an "author." MJS: No. I see it as a passion, as a love, and as necessary as breathing. If I make money from my writing then all the better, but that's not why I do it. I do it because I have to. MJS: I've always loved reading, and writing goes hand in hand with that. Even as a child I dreamed of being a writer. I wrote numerous short stories and fan fiction of whatever I was into. I began on my mother's typewriter, writing for hours. I can even remember beginning a Thriller novel before I was a teenager, on an outdated PC. But, it wasn't until recently that I made a pact with myself to get over my insecurities and anxiety, and take the plunge into publishing. Best decision I've ever made. MJS: I have two different series on tap right now, and the next book I release will be the first of what I am calling "The Last War Saga." It's a character driven high fantasy series, and was inspired by a Dungeons and Dragons campaign I create(d) and run on Friday nights with a great group of friends. I am expecting to release the first in the series, "The Girl With Red Hair," in June 2016. Then I'll bounce back to publishing the sequel to "The Mighty," which is in first draft form now. MJS: Write. It's the only way to become a writer. If you write, you are. If you don't, you're not. It's truly that simple. All the rest is just dressing. 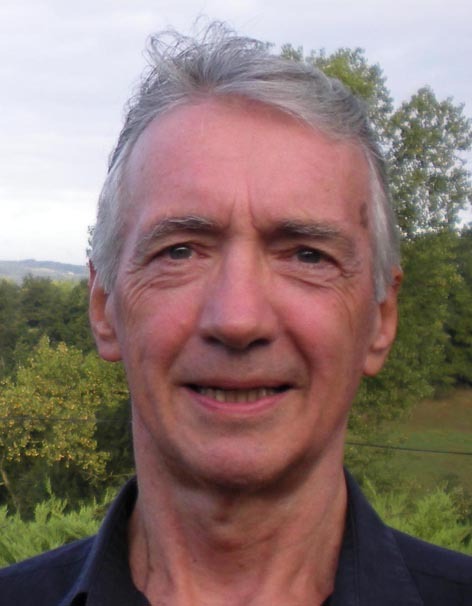 I started writing fiction as a student at Trinity College, Dublin, and continued as a journalist in Athens and then as a leader writer on the Daily Express in London. I had a brief period as a University Tutor, but then set up my own business as a Creativity Consultant with Accountants and Management Consultants - where one challenging contract involved my trying to show nuclear scientists where they might dispose of nuclear waste! I then moved to writing fiction full time, which I love and want to take further. P. Rowan: Harps & Tears centres on Bronkovski, a Polish/US nuclear scientist whose wife left him for a Jewish environmentalist. He is furious, and intent on revenge against Israel. When we meet him he is making a nuclear bomb in Ireland's West Cork for ruthless Islamic activists. My main man, US journalist Rudi Flynn, is lured in and seduced by Irish charm and blarney, but he knows that Middle East money is funding the deviant nuclear scientist in Ireland. There are ruthless rogues everywhere, including Irish politicians, but Flynn's lesbian hotel receptionist agrees to seduce and probe the evil Bronkovski. Despite his battered self-esteem following his wife's affair with another woman, Flynn soon meets a succession of enchanting women - in particular, ex-prostitute, Claire, with whom he embarks on a passionate love affair. As he blunders into the terrifying conspiracy between Bronkovski and his Middle East funders, Flynn gets warned off and is eventually assaulted, with a near death experience involving murderous assassins. Eventually, however, there is sufficient evidence to persuade Irish politicians, who have been backing Bronkovski, to disown him, which allows British aircraft to bomb the deserted Irish seminary for missionary priests, where he has been hiding. IAN: Is Harps & Tears published in print, as an eBook or both? P. Rowan: It is an Amazon Kindle e-book. IAN: Where can we purchase a copy of Harps & Tears? IAN: Do you use an outline or do you just wing a first draft? P. Rowan: I used a story outline and then chapter outlines for my 4 dark humor thrillers. But I am doing just chapter outlines for my current book as I'm not quite sure yet where it's going. P. Rowan: I used first person present tense (taking on the identity of my main man Flynn) for my dark humor thrillers. But for the story I'm presently writing, I have reverted to third person past tense, and I am enjoying the different writing experience. IAN: How do you come up with your titles? P. Rowan: Dark Clouds features a nuclear mushroom cloud cover as ISIS try to nuke London. Weimar Vibes has a movie picture of Marlene Dietrich on the cover as I was trying to present an image of those dark 1930s pre-war days in Germany. Under Cover has (I think) a rather attractive spy + flags for the main undercover secret service agencies. 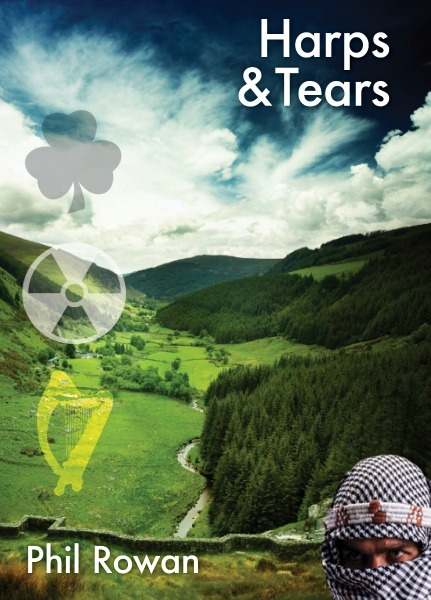 Harps & Tears is set mainly in Ireland, where I've got a nuclear symbol (for the nasty scientist) + a shamrock and a harp - with a scary jihadist waiting covertly for evil opportunities, which will bring tears to the eyes! IAN: How much of Harps & Tears is realistic? P. Rowan: Well - rural Ireland is maybe a good place for an embittered Polish American nuclear scientist to construct nuclear weapons, which can then be shipped secretly in fishing boats or covert (at the time maybe Libyan) submarines to the Middle East. It hasn't happened yet ... but who knows what might evolve! IAN: What books have most influenced your life? P. Rowan: As a young Catholic growing up in Ireland, I was very much taken with those authors who were banned by the Church! My favourites were by James Joyce, J.P. Donleavy and Henry Miller. But I was later drawn to Scott Fitzgerald, Ernest Hemingway and - much later - Primo Levi, who shocked and moved me with tales of his survival from an Auschwitz nightmare. P. Rowan: James Joyce or J.P. Donleavy - but maybe Scott Fitzgerald if I met him in Paris! P. Rowan: Brooklyn by Colm Toibin. I was hooked by the movie, which was great, and I'm enjoying the adventures of young Eilis in New York, where - like a lot of my ancestors - she escaped to from the problems many faced in Ireland since the famine. P. Rowan: Oh yes - although one might need some other source of income, as it's a very competitive business - and one has to make a great effort - but it is very satisfying! 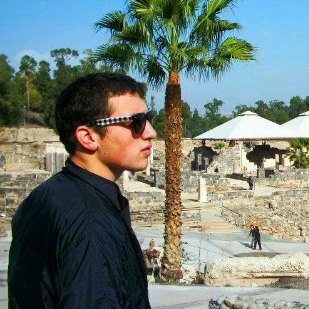 P. Rowan: I got the impetus one afternoon during my first year as a student at Trinity College in Dublin. I sat down and started to do a short story about an attractive woman. My pen just kept moving to the end, and I was fortunate, because it was taken up by a small College magazine, which encouraged me to continue - although I was diverted for some not very satisfying years as a UK tabloid journalist. IAN: Did you have to travel much for your book research? P. Rowan: My work as a journalist took me to quite a few places around the world, and when I then moved on to an academic post, I was fortunate in having long paid leave periods, so my wife and I were able to travel extensively ... at least until our kids arrived! P. Rowan: My next story is a stand-alone. It is about a young Irish playwright, Jack, and his actress girlfriend, Maria, who - out of nowhere, but with a great play - catch the attention of a Hollywood agent and take a flight to LA. The agent wants Jack to write a screenplay, while Maria is offered a small movie part. It goes well for a while, but Jack gets distracted by another woman, so Maria takes off for India. We then follow their amorous and other adventures from two perspectives ... only I'm not quite sure how the story is going to progress, but I'm enjoying the writing! P. Rowan: If you get the urge, just sit down with a pen (preferably a biro) and scribble away for 40 or 50 minutes. If you cover a few sheets of paper without stopping, you're probably well under way and won't want to stop. 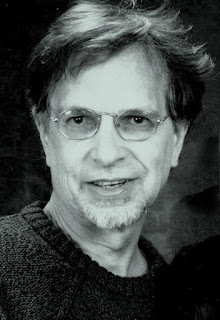 R.K. Gold is an award winning novelist from Buffalo, NY. He graduated from the University of Maryland with a Bachelor's degree in English and Literature and has appeared in over a dozen literary journals and magazines. His novella Just Under The Sky won the People's Book Award in December 2015. His collection of short stories, The Little Black Book, reached #7 on the Kindle top 100 short reads list in July 2015. His influences range from traditional American writers and poets like Ernest Hemingway, Langston Hughes, and Kurt Vonnegut, to pop icons like Alan Moore, Stan Lee, and Stephen King. confronted with the reality that the distinct rules of good and evil he was raised to believe in are wrong. When abandoned in the forest surrounding his village, a place his people consider to be pure evil, Jasper realizes things in life are never black and white. 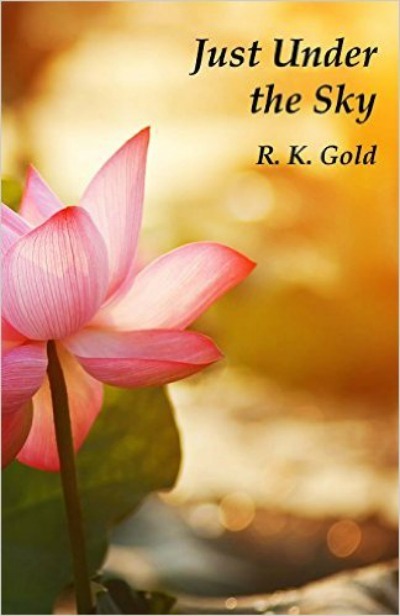 RK Gold: Just Under the Sky is published in both formats. You can find it in paperback on Amazon, Barnes and Noble, and Weasel Press’ website. Digital copies can be found at the same locations as well as Smashwords. IAN: What inspired you to write Just Under the Sky? RK Gold: I was living in Montana at the time. Being around that much natural beauty was impossible to ignore and rubbed off on my work. The first chapter started as a bit of a joke. I did not have much intention to finish the manuscript, let alone edit it and pitch publishing houses. But as I developed the history of the forest and the rules of its existence, my desire to finish became insatiable. RK Gold: Throughout the entire text Jasper looks up at the sky to use it as a sort of gauge to figure out how deep into the forest he is. There is one scene in the book where he stands over the clouds and looks out at the rest of the world. To him, all the answers are always up, and that moment was the first time they felt within reach. 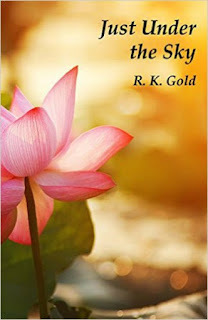 RK Gold: What I came away with from writing this book, is that one of the most difficult things to do in this world is to question the lessons you learned growing up. I guess the lesson to learn is don’t be afraid to acknowledge you don’t know everything. RK Gold: Stephen King without a doubt. I have a copy of his book On Writing on my nightstand. He’s just so prolific, and still somehow so modest. And though he’s a horror author I love how he can bring humor into the scariest moments of our life. RK Gold: I’m reading a few. I just finished Edge of Eternity and Saving Capitalism. I just started Race Matters. RK Gold: If I am being completely honest I would not be where I am today without Google. Whenever I have had questions about what my next step should be, or how to find a publisher, or tips on developing my brand, I would use Google. RK Gold: Absolutely. My writing is my career. Whether it be articles, blogs, or books, I make my living from writing. It’s not something I do only when I feel inspired, it’s something I have to do every day. And the more I treat it as a job, the more I am rewarded with the perks of being employed. RK Gold: Yeah, not sounding like an idiot. Sometimes I feel like I beat away at a point trying to figure out how to express it just right only to come back from a walk with my dog and realize a simple solution for the whole thing. RK Gold: My next book is another novella titled Brinwood. I am publishing with Weasel Press again, and the release date is set for this coming spring. Brinwood is a violent thriller following a man named Casper’s return to his hometown to rescue his sister from a religious cult. RK Gold: When it comes to writing, treat it like a job. A lawyer wouldn’t be a lawyer if he or she only practiced law when they were feeling inspired. Put in the 9-5 hours and you will see the results. RK Gold: Thank you so much for all your support. Your kind words have meant the world to me.